This book is about a girl named Isabell, who’s sister has cancer. 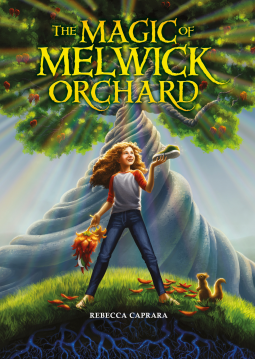 So in the starting Isabella finds a little tree growing in long since abandoned Melwick Orchard which stopped growing years before, then a squirrel tells her to put her shoes in the hole he dug in front of her. The next day the tree has fully grown into a giant tree with feathery balls with fruit inside and what’s the fruit?? peach? Nope. Apples? Nu uh. Shoes? YES!!!!! she finds pairs of shoes in the balls! I like this book because it is magic and I can kinda relate to Isabell because she has a hard time making friends and she’s grumpy. I recommend the book to everyone who is in 3rd grade and up who likes magic. I give this book 15 magic stars. It sounds cute and whimsical – how is the whole cancer/relation aspect of the book? Sorry for the delay. I was on vacation. Cancer is a big part of the story because it impacts why she is acting the way she is. They aren’t always talking about cancer but it is there.